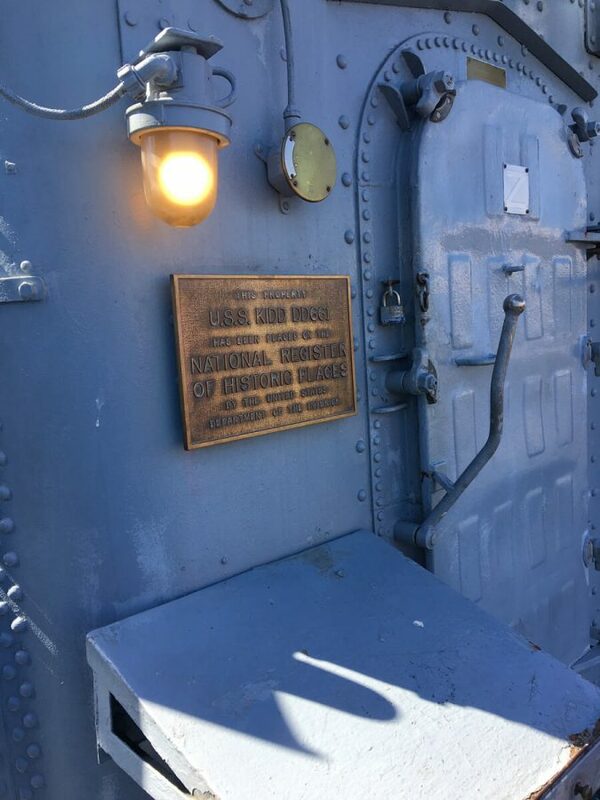 The firerooms aboard the KIDD provided the super-heated steam necessary to generate power and propulsion for the ship. 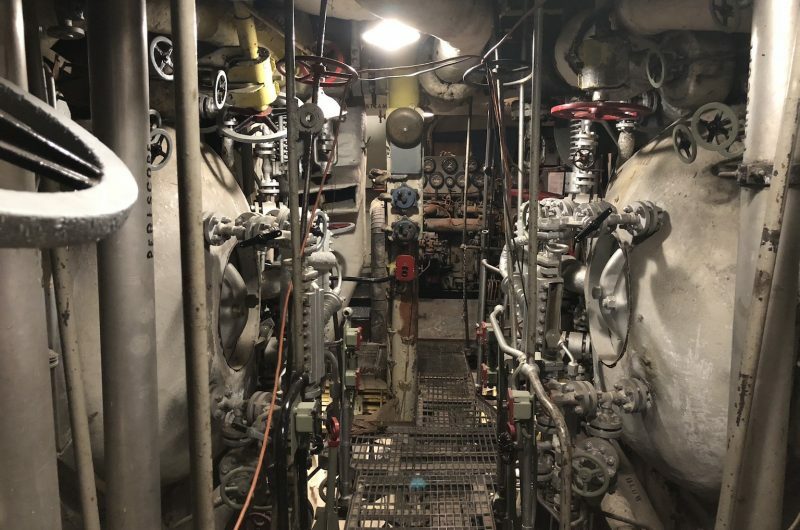 The power plant aboard the KIDD is made up of four boilers which could generate 650 psi (pounds per square inch) of super-heated steam at 850° Fahrenheit. 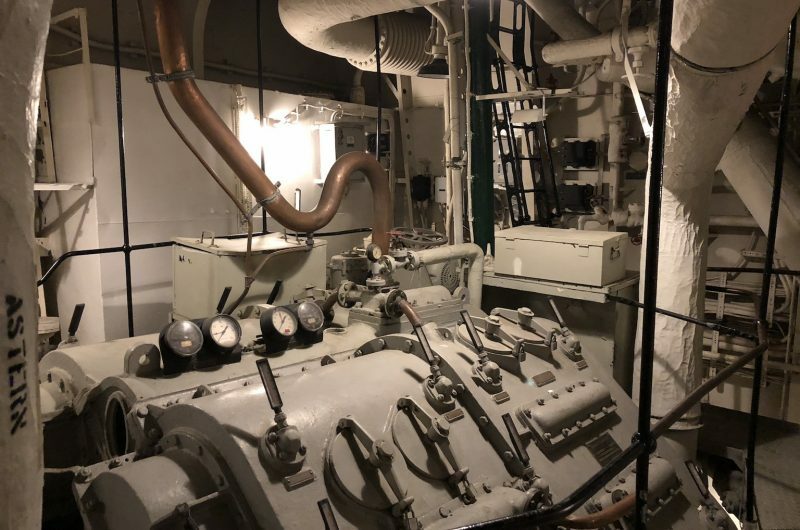 These boilers fed the steam into two General Electric geared turbines which could produce 30,000 HP (horse power) each for a total of 60,000 HP. 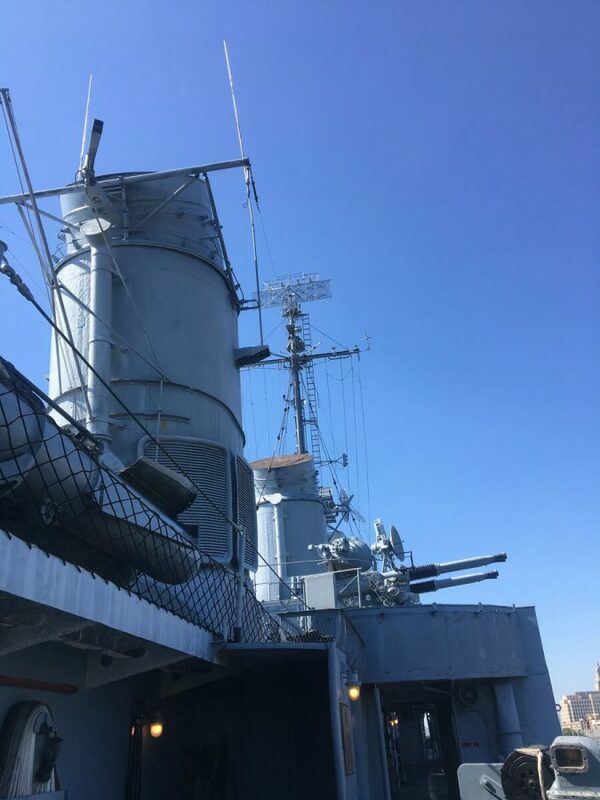 This gave the Fletcher-class destroyers like the KIDD a respectable maximum speed of 37 knots. The operation of the power plant was surprisingly simplistic. Thick black oil was burned in the boiler furnace in the firerooms. The fire heats water contained in the drums of the boiler, turning it into super-heated steam. 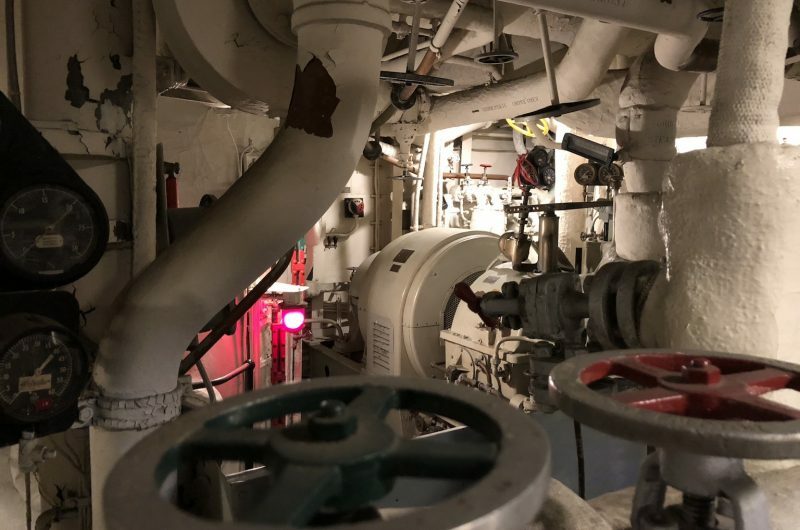 That steam is then piped into the enginerooms and directed into the high-pressure turbine. The force of the steam turns the blades of the turbine which drives a gear box. 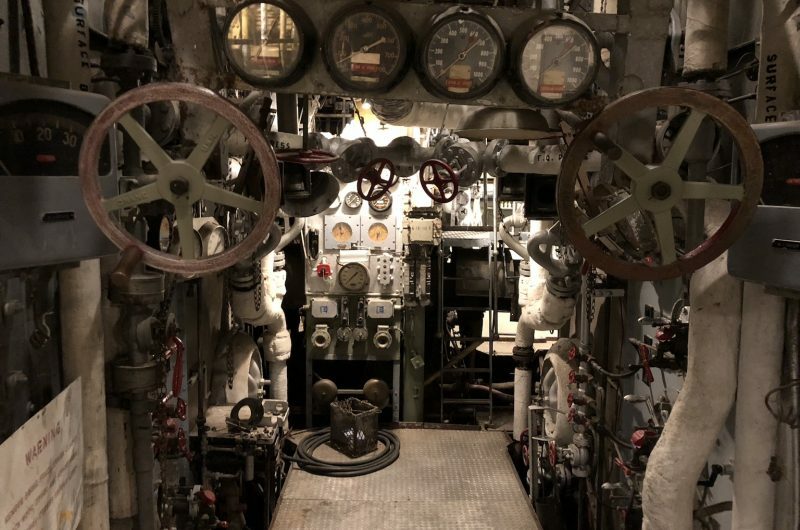 The spinning gears then turned the propeller shaft which propelled the ship through the water. The process, however, did not end there. The steam was recycled. Once it passed through the main turbine, it then exited into a second low-pressure turbine where it would spin another set of blades. From there it went to a condenser where the steam was cooled as it flowed past a series of pipes. These pipes contained cool sea water. The sea water and steam, however, never mixed. Only fresh water could be used in the boilers. Once the steam condensed, it was stored in a tank and used over and over again by the boilers. 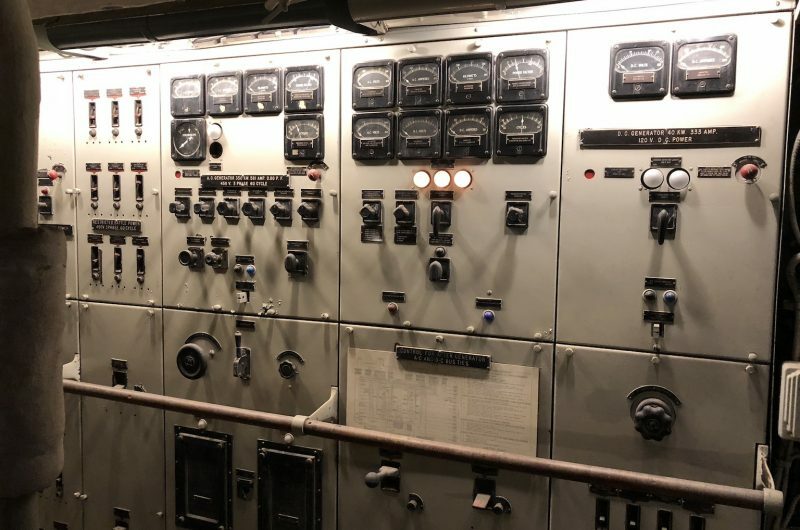 The engine is controlled from a throttle board where the throttleman turns a valve that controls the amount of steam going into the turbine. 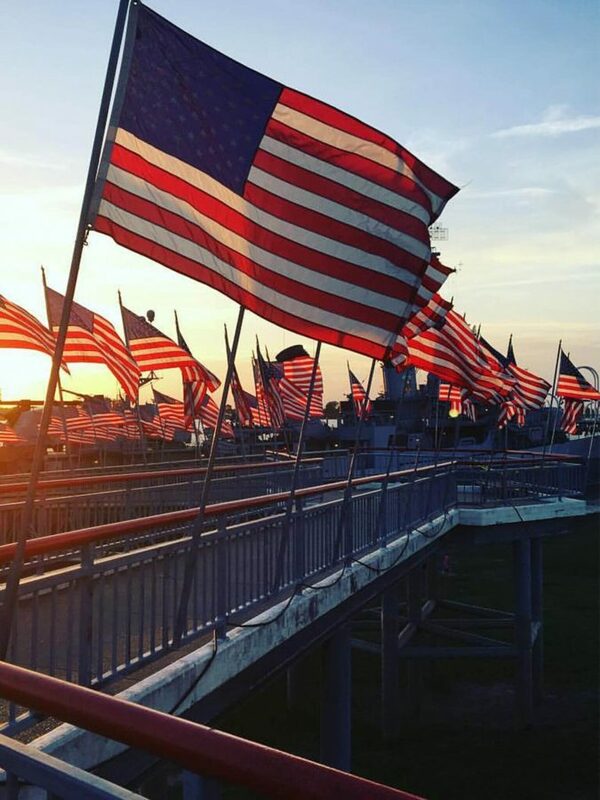 The Officer of the Deck on the ship’s bridge tells him how many revolutions per minute (rpm) he wants the propeller to turn. The throttleman then turns his valve until his rpm gauge (a tachometer) matches what the Officer of the Deck has ordered. However, his actions must be matched by the boilermen in the firerooms. 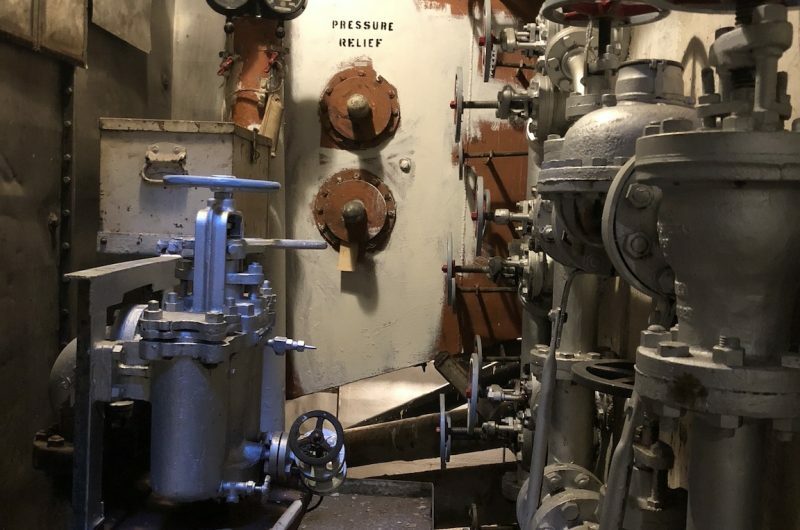 If he slows down the turbine without the boilermen decreasing steam production, the pressure in the boilers will rise until the safety valves are blown to keep the boiler from rupturing. 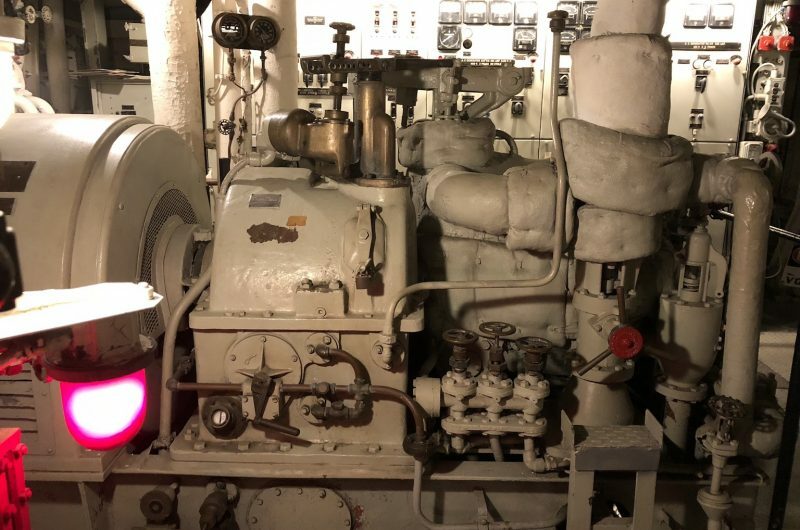 By the same token, if the throttleman opens his valve to speed up the turbine before the boilermen can produce more steam, the pressure in the boilers will drop, all the machinery will slow down, and power throughout the ship will dim. Teamwork is essential. 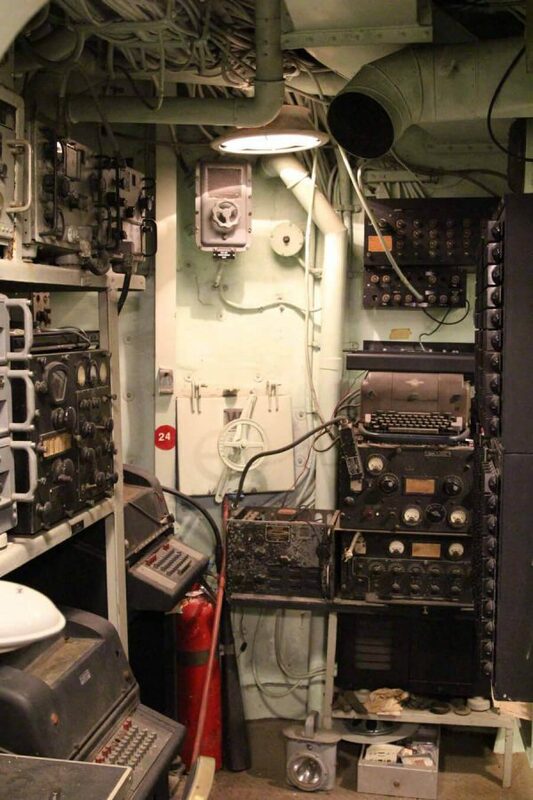 There are two firerooms and two enginerooms aboard the KIDD and all Fletcher-class destroyers. 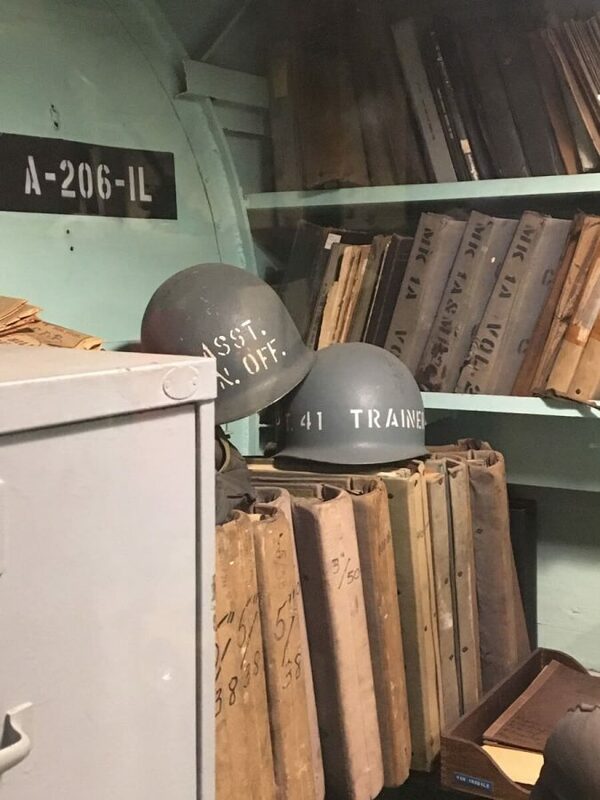 The duplication of machinery was a standard feature of U.S. World War II destroyer design, enabling our ships to withstand incredible battle damage and still survive. Each of the firerooms could be cross-connected to either engineroom. This is no better exemplified than by the KIDD’s encounter with a kamikaze off of Okinawa on April 11, 1945. 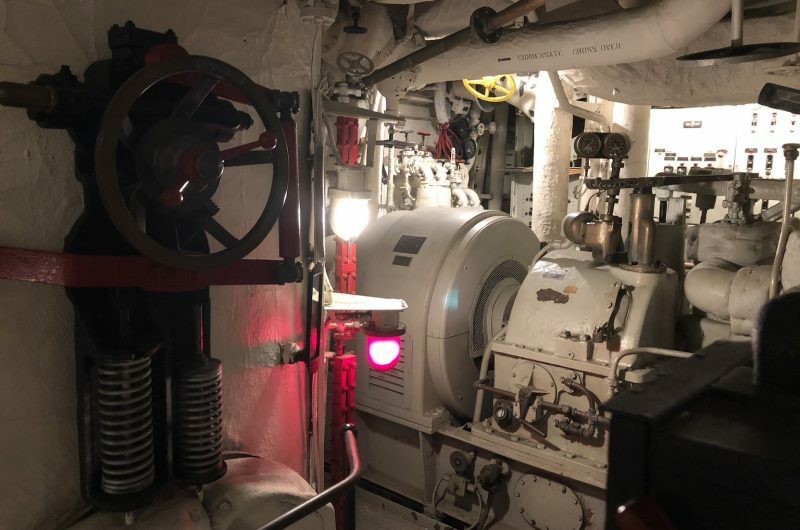 When the forward fireroom was destroyed during the attack, the aft fireroom took over the production of steam for both enginerooms, allowing the ship to get underway and out of harm’s way. 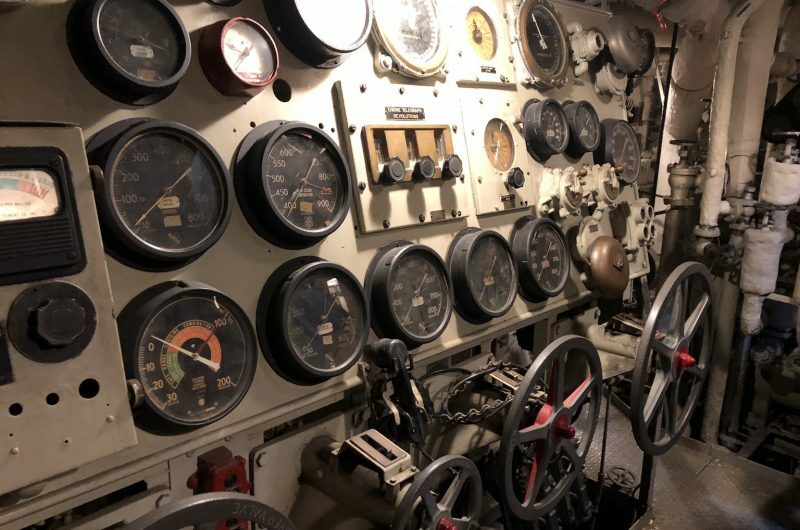 Unfortunately, of the four machinery spaces, only the forward engineroom has been completely restored aboard the KIDD thus far. None of these spaces are open to the general public at this time.